The Supreme People's Court (SPC) on Wednesday announced sentence on the retried criminal case involving Gu Chujun, former chairman of refrigerator maker Guangdong Kelon Electrical Holdings, in Shenzhen, south China's Guangdong Province. The SPC revoked the original sentence's convictions of Gu for falsely reporting registered capital, falsifying and withholding information, and changed Gu's sentence to five years in prison for embezzlement. Gu was arrested in 2005. In 2009, a final court ruling by Guangdong Higher People's Court sentenced him to 10 years in prison. He was also fined 6.8 million yuan (1.01 million U.S. dollars). 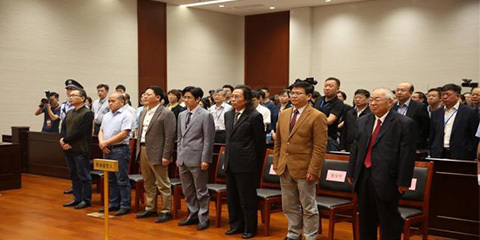 The SPC also revoked the original sentence's convictions of Zhang Hong, another defendant of the original case, for falsifying and withholding information, and affirmed the original judgment of two years in prison with a suspension of two years for embezzlement. The other six defendants of the original case were acquitted. They were all sentenced prison terms of below four years in the original case. The SPC said Gu and others falsely reported registered capital, but the act was of relatively small social harm and was not a crime. It also said Kelon made false sales at the end of 2002, 2003 and 2004, leading to false information in their annual reports, but there is no sufficient evidence to show that this has seriously harmed shareholders' interests, hence Gu and others should be acquitted of charges. The original ruling on one count of embezzlement involving 290 million yuan was supported by proper evidence. Another count of embezzlement involving 63 million yuan lacked evidence and the original ruling applied the wrong law. In September 2012, after serving his term in prison, Gu filed a petition to the SPC. The SPC, after a review, announced a decision to retry the case in December 2017 and set up a collegiate bench with Pei Xianding, chief of the SPC first circuit court, as the presiding judge. In a guideline on the better protection of property rights issued in 2016, China pledged to provide equal, comprehensive and law-based protection to all kinds of property rights and encourage public participation in the process. The Central Political and Legal Work Conference held in Beijing in early 2018 vowed to accelerate the retrials of major property-ownership-related cases to boost business confidence and foster positive market expectations.